The pyramids are located in Teuchitlán, just 2 1/2 hours from Lake Chapala – Ajijic, Mexico on the highway for the city of Tequila. The pyramid complex is believed to have been built around 300 B.C. and then abandoned around 900 A.D. The actual pyramid site is not yet run over with tourist shops (there’s just one small building with souvenirs as this is written) and it’s a little hard to find as it’s not yet well signed. But, it’s definitely worth the effort to find it if you like archeological ruins at all. It makes a nice day trip to drive to the site and explore. There’s a small entrance fee and a small fee to park nearby. Of course you can’t climb all over the various structures but you can get very close and get some fantastic close up shots of all the structures. Since, the pyramids are situated on a hill top you also will be treated to some breathtaking views of the pretty surrounding country side. 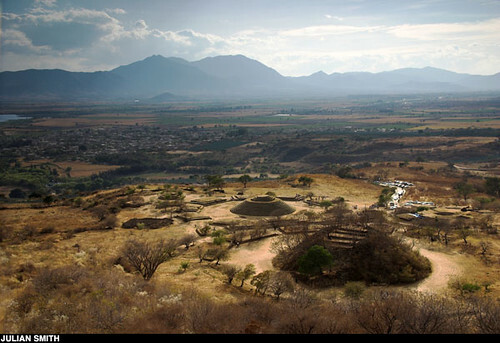 The pyramids of Guachimontones is just one more interesting place to visit as a day trip from Lake Chapala Ajijic. If you’d like to visit the this prehistoric site while in the Lake Chapala area please let me know at elsidmx@yahoo.com to schedule a day trip there at very reasonable rates. What’s Sid’s Favorite Mom & Pop Lake Chapala Restaurant?